For what it’s worth, the black-and-white photo, sepia-toned to Instagram perfection by actual decades, doesn’t reveal the emotional roller-coaster my 6-year-old body was set to undergo. There I am in the front row, my crossed, corduroyed legs angled akimbo with fidgety hands clutched in my lap. The kids behind me—three girls, two pigtailed, and a boy about my age—are eyes-closed laughing in open glee. Not me. My mouth hangs slack above the paper-bow-tie name tag pinned to my wide-collared shirt, a look of excited confusion in my eyes. My kids’ eyes widened at the reveal that I, their father, had been broadcast across the analog airwaves of Televisionland. “Do you remember what it was like?” she asked. “I remember,” I sighed. It was 1981, a year after an armed gunman took the WCPO newsroom hostage. I didn’t know about that incident, of course, when my mom pulled the family Volkswagen bus into a parking space behind the station’s Brutalist concrete studios downtown. My mind was spinning with the two-fold windfall of getting a day off school and scoring an appearance on Cincinnati’s crown jewel of children’s programming, The Uncle Al Show. My mother took my hand, clammy from nerves and excitement, and pushed through the heavy door that led into the Channel 9 studios. The room where TV magic happened was indeed magical. The set hadn’t much changed from the early days, with painted-paper trees, bushes, and a red barn on whimsical, illustrated backdrops. Parents were directed to a set of fold-out bleachers, while we children sat on the soundstage, where we fidgeted and whined, laughed, and fought—until Uncle Al and Captain Windy took the stage and captured our attention with accordion-led sing-alongs, puppet shows, and ham-fisted storytelling. It was a corny scene-for-scene re-enactment of every episode I’d watched at home on TV, but the escape from everyday life was something to be cherished. It was 30 minutes of pure joy. Until we visited the circus, and Lucky entered stage left. To be fair to my younger self, Lucky the Clown was objectively terrifying. I admit to being a nervous child whom the family doctor medicated to guard against worry-induced ulcers, but I certainly wasn’t the sole child in the show’s 35-year run to flee screaming from Lucky’s scary getup: floppy red polka-dotted jumpsuit that extended upward to his jawline, totally obscuring the neck; circus clown whiteface, complete with a grotesque red smile that swallowed his chin, crimson button nose, red circles under the eyes, and blood-colored eyebrows; and a mauve moptop whose once-tight curls, loosened by the weight of time, concealed parts of his face. I ran straight to the bleachers, to my mother, at the sight. And Captain Windy, stalwart protector of her husband’s waning empire, followed close behind, instructing me to return to the stage. I’ve heard since that Windy was said to be “mean”—I credit that to the same rumor mill that insisted Uncle Al hated children, but she certainly understood the bad optics of a child running off-camera in terror. Eventually I did leave the bleachers and slink back to the stage, just in time to rejoin the group as Uncle Al spoke the familiar refrain of his exit prayer: “Thank you for the birds that sing, thank you, God, for everything.” After the group photo shoot, I rushed back to my mother as the sound of the closing song, “It’s a Small World After All,” echoed overhead. “I don’t want to do that again,” I told her. And I never did. Scary for some, yes, but The Uncle Al Show formula had long since been established to bring mirth and joy to the vast majority of children. By the time I made my appearance, the show had chugged along faithfully for more than three decades. To be fair to my younger self, Lucky the Clown was objectively terrifying. I certainly wasn’t the sole child to flee screaming from Lucky’s getup. Al Lewis and his wife Wanda moved to Cincinnati from Cleveland in 1949. Both had been students at the Cleveland Institute of Art, during which time Lewis worked as a nightclub performer. He eventually landed a radio show, then moonlighted at television station WEWS, Cleveland’s Scripps affiliate. When a new Scripps TV station was developed in Cincinnati, the Lewises moved south, where he became art director at WCPO. Wanda didn’t seek the spotlight like Al, but she took a job on Paul Dixon’s Song Shop, a pantomime program where the popular DJ danced and mouthed to the day’s hit songs; for songs that couldn’t be pantomimed, Wanda drew images along to music. Her husband’s big Cincinnati break came two months later, when general manager Mort Watters, noting his new hire’s skills as an accordion player, offered him an evening show to fill an empty timeslot. And so Al’s Corner Drugstore featured Lewis, dressed in a soda jerk’s bow tie, taking phone-in requests for songs to perform on his squeezebox. He hosted an 11 p.m. big band show, too. But the nature of filler shows being that they exist to occupy unfilled spots, Lewis’s show was moved to 8 a.m. the next year, a development that concerned him. “I remember Al said, ‘Who’s going to watch television at 8 o’clock in the morning?’” Wanda told Cincinnati Magazine in 2011. The answer came via a stroke of serendipity. “The klieg lights were so hot that they kept the doors open,” says Martini. “Some kids were standing in the doorway and he invited them in, put them on the air a little bit. The next day some more kids came by, and it wasn’t long before moms started calling in asking, ‘How do we get on the kids show?’ They said, ‘What kids show?’” The soda jerk character was named Uncle Al, and when Paul Dixon left for New York in 1954, Wanda joined the cast as Captain Windy, a facetious name Dixon assigned for her quiet demeanor. While Lewis’s on-screen career started by accident, his strict determination kept The Uncle Al Show going—when it ended in 1985, it was the longest-running children’s show ever. He built the sets himself, wrote all the stories, and held staff meetings after every show to figure out what the cast and crew could do better. Even the backdrops were handmade by Lewis and Wanda. Puppets were introduced in 1957 when Larry Smith joined the show, bringing on board such cloth characters as Teaser the Mouse and Hattie the Witch. In 1958, the show was picked up by ABC to air nationally on Saturdays, an arrangement that ended after a year. But Lewis powered on, bringing stories, accordion- and banjo-driven songs, and character sketches to young children across the region throughout the 1960s, when it was scaled back to a single 90-minute show per day. Lewis, always striving to outdo the last show, seized on emerging technologies to enhance his visual storytelling. “They did some pretty far-out things for that era for TV special effects,” says Martini. “I loved the submarine stuff. They’d shine a light onto this big fishbowl, then they’d use a green screen and superimpose it on the submarine and tell the kids to just move really slow. It really did look like they were underwater.” He recalls trips to space, the giant on a rock, and Toby the elf as other examples of the show’s green-screen innovations. 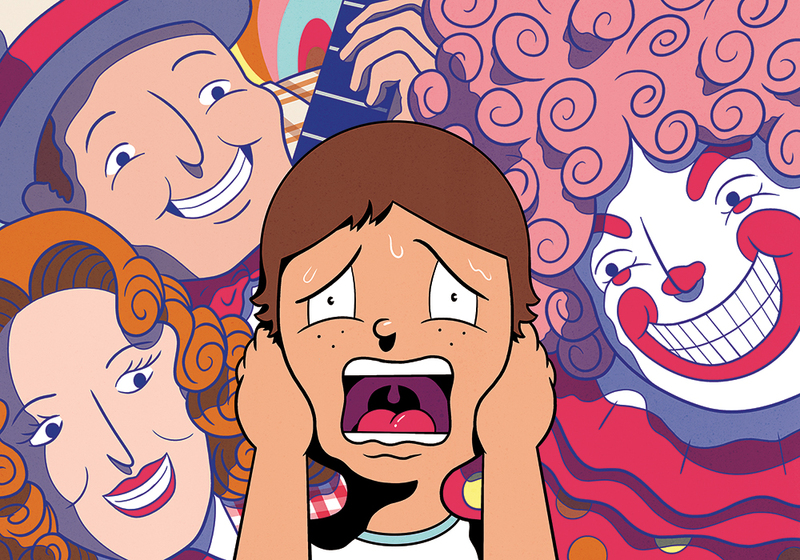 Cincinnati actor Jack Williams came onboard in 1972, embodying three or four characters during each episode of the show, including Pal the Dog and, you know, that clown. But the emergence of free-range parenting philosophies in the ’70s that encouraged free thought and open expression didn’t mesh well with Uncle Al’s militaristic style, which involved Lewis giving orders and children’s de facto obedience (understandable, given he wrangled preschoolers for a living). A 1978 issue of this magazine ran a cover story titled “The Uncle Al Show Is for Uncle Al” that interviewed various mothers and local childhood experts for a piece that questioned his ability to keep up with developing ideas about child-rearing. Changing times and shifting demographics caused the show to fade in popularity; it was cut to a half hour a day and, eventually, just a weekend show. Finally, in May 1985, the rebranded Uncle Al Town came to an end, though both Lewis and Wanda stayed on in WCPO’s art department through the late ’80s. There’s always something to do, but I have to agree—it would be fun to watch my similarly anxiety-prone children flee the stage in terror on live TV.